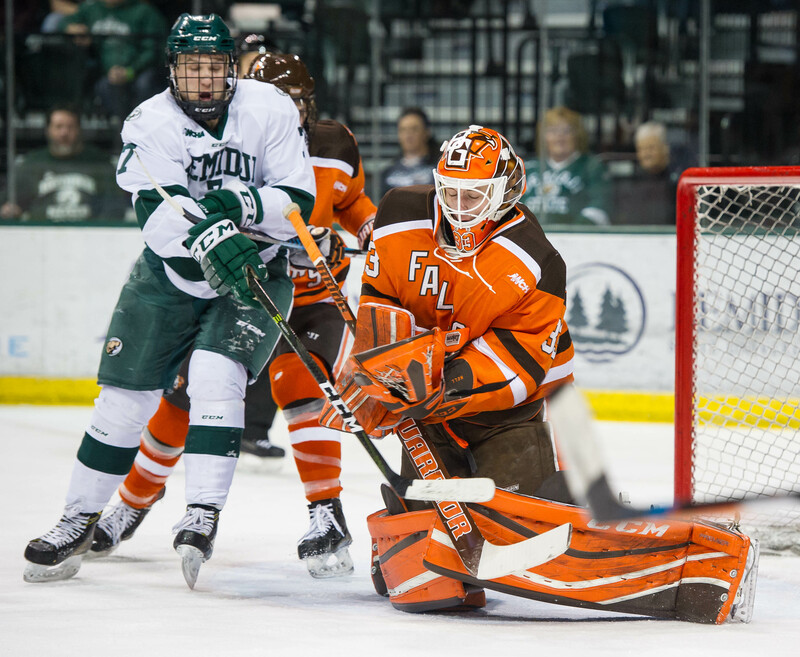 Bowling Green's Chris Nell (right) makes a save as Bemidji State's T.J. Roo looks for a rebound during Friday's game in the semifinals of the Western Collegiate Hockey Association (Photo by Todd Pavlack/BGSUHockey.com). BEMIDJI, Minn. — Bowling Green never stopped competing and never stopped battling Friday night. The Falcons finally were rewarded for their perseverance in overtime. Kevin Dufour’s third goal of the game 17:23 into overtime gave the Falcons a 4-3 win over Bemidji State in Game 1 of their Western Collegiate Hockey Association semifinal series at the Sanford Center. The Falcons can sweep the best-of-3 series and advance to the WCHA playoff championship game for the first time with another victory Saturday. BG has lost in the single-elimination semifinals the last three seasons. But a win by Bemidji — the regular-season league champion — forces a third and deciding game Sunday. Faceoff is 8:07 eastern Saturday and 6:07 Sunday. BG has won six straight games to improve to 20-17-2 overall. The Falcons finished fourth in the WCHA during the regular season. Bemidji (22-15-3) won the league’s regular-season championship. The Falcons were out-shot 48-34. The Beavers held a 25-13 edge in shots during the first two periods and a 41-23 margin at the end of regulation, but BG generated much more sustained pressure during an entertaining and back-and-forth extra period. Dufour scored from the right side of the crease, sliding in the rebound of Adam Smith’s shot from the left circle. Smith’s shot missed the net on the left side, hit the boards behind the net and ricocheted perfectly to Dufour on the back door. “It was a bouncing puck, and I managed to get it in,” Dufour said. Dufour received the puck on his backhand, spun around to his forehand and beat goalie Michael Bitzer for the game-winner. BG’s senior forward sent the game into the extra period when he scored with 6:30 left in regulation. Jacob Dalton’s shot from the left point barely scraped the bottom of the crossbar and landed on the goal line, and Dufour poked in the rebound. After Dufour opened the scoring at 10:58 of the first period, Bemidji rebounded to hold two one-goal leads. The Beavers’ last lead came after Nate Arentz scored just 1:05 into the third period. HOT STICK: Dufour’s hat trick was his second in the last five games. He has seven goals and two assists in those five games, all wins. The 6-foot, 195-pounder had one goal and one assist in Saturday’s 5-3 series-clinching win against Ferris State. Dufour’s 17 goals tie Mitch McLain for the team lead, and he has 29 assists. His 17 goals and 29 points are career highs, beating his previous bests of 14 and 26 last season. His 12 assists also match his career best of last season. SENIOR POWER: Dufour was one of three BG seniors to have strong games. The others were forward Matt Pohlkamp and defenseman Sean Walker. Pohlkamp had one goal and one assist, while Walker played well defensively. Pohlkamp and Walker both had an on-ice rating of +2, while Dufour was a +1. Pohlkamp has had at least one point in three straight games, totaling three goals and five assists in that span. REVIEW: Bemidji showed why it won the regular-season championship during the second period when it held a 14-5 edge in shots. The game was 1-1 after one period and 2-1 Bemidji after two periods. The Beavers are the second-best defensive team in the nation, allowing 1.93 goals per game. They were first going into the game at 1.85. Bitzer leads the nation with a 1.70 goals-against and is fourth with a .931 save percentage. “They defend extremely well, and then they come at you offensively,” Bergeron said of Bemidji. “They’re not a team that sits there and takes it. They push hard. The game was physical and filled with scoring chances for both teams. OVERTIME: The teams exchanged scoring chances in the overtime, but the Falcons were able to generate sustained pressure during the extra period. BG had 11 shots in the overtime, compared to Bemidji’s seven. “The overtime was our best sustained play,” Bergeron said. The Falcons mixed and matched just nine forwards on three lines in overtime. They dressed 11 forwards and seven defensemen for the game. “We’re in shape. That’s why we looked good in the overtime,” Dufour said. The Falcons are 4-1-2 in overtime this season, while Bemidji is 2-1-3. STATS: Alec Rauhauser, who is Walker’s defense partner, assisted Dufour’s first goal and was a +2. McLain, Stephen Baylis and Brett D’Andrea each had five shots on goal for BG, while Dufour had four. Mark Friedman, Pohlkamp and Walker each had three. BG’s Tyler Spezia assisted on Pohlkamp’s goal, extending his point streak to six games. He has three goals and four assists in that span. GOALTENDING: BG goalie Chris Nell held Bemidji scoreless for the final 35:38 after allowing two soft goals. The junior finished with 45 saves, including a glove save on Leo Fitzgerald just a minute before Dufour’s game-winner. The point-blank chance came off a 3-on-2 rush. Bitzer stopped 30 shots. He was a first-team All-WCHA selection Thursday. Nell, a first-team pick last season, has a 2.18 goals-against and a .915 save percentage in 32 games. “What I think are two of the top goalies in the league going head to head, I don’t think either one had their best game,” Bergeron said. SPECIAL TEAMS: The BG penalty-killing was 5-of-6, but didn’t allow a goal during the final five chances. Five of those chances came in the third period, including three 4-on-3 advantages. Three of those five came with Bemidji holding a one-goal lead, but the Falcons didn’t allow the Beavers to stretch their lead to two goals. BG allowed just four shots during the 7:30 it was short-handed. “Our penalty-kill was pretty good,” Bergeron said. The BG power play was 0 of 2 and had just three shots in 3:54. DISCIPLINE: The Falcons were disciplined, taking six penalties, all minors. BG had been called for 40 penalties in its last four games and is the eighth-most penalized team in the country at 15.8 minutes per game. Bemidji is the seventh-least at 10.3 minutes per game. The Beavers had four penalties in the game, all minors. THE VIEW FROM BEMIDJI: The Beavers finished the game with an 86-68 edge in total shots attempted. THREE OF A KIND: The Falcons have fashioned three straight 20-win seasons for the first time since 1990. Their back-to-back 20-win seasons in 2015 and 2016 were their first since 1995 and 1996. BG was 22-14-6 last season, and 23-11-5 in 2015. THE LAST TIME: The Falcons’ last overtime game in the playoffs was March 13, 2015 against Northern Michigan at home in Game 1 of a quarterfinal series. Spezia scored at 19:32.9 to give BG a 3-2 win. LINEUP: Falcon forwards Casey Linkenheld (lower body) and Matt Meier (upper body) aren’t on the trip because of injuries. Forwards Jakob Reichert and Joe McKeown are on the trip, but didn’t dress for the game. LEAGUE SEMIFINALS: The Falcons haven’t played in their league semifinals since 2012 when they advanced to the Final Four of the now-defunct Central Collegiate Hockey Association. Michigan posted a 3-2 double-overtime win over the Falcons in that semifinal at Detroit’s Joe Louis Arena. The Falcons advanced to JLA by winning a first-round series at Northern Michigan and a quarterfinal series at Ferris State. BG has lost in the single-elimination semifinals of the WCHA playoffs the last three seasons after winning a first-round series at home. NEXT: If the Falcons win tonight, they’ll visit the winner of second-seeded Michigan Tech and third-seeded Minnesota State in the single-game, winner-take-all championship contest. Tech was a 5-1 winner at home in Game 1 of its series. If Bemidji wins its series against BG, it will host the championship game. The highest remaining seed hosts the championship game, meaning BG can’t host the contest. The championship game will start at 7:07 p.m. eastern if it’s at Tech, and 8:07 p.m. if it’s at Bemidji or MSU, WCHA Commissioner Bill Robertson said Friday. The playoff champion receives an automatic berth to the NCAA playoffs.